Strategy is independent of technology, and should precede the selection, architecture, and implementation of the technology. In fact, any choice for or work on technology before the development of the intranet strategy is synonymous with putting the cart before the horse; except this horse is massive and dam expensive. Regardless of the technology, most intranets risk failure without a well-defined strategy. Even the most successful and complex intranet platform, also known as SharePoint (MOSS 2007, though not the most complex, certainly the most pervasive), requires a strategy or plan. “Without proper architecture and governance, I can guarantee you that SharePoint will fail,” says Bob Mixon, President of Mixon Consulting. 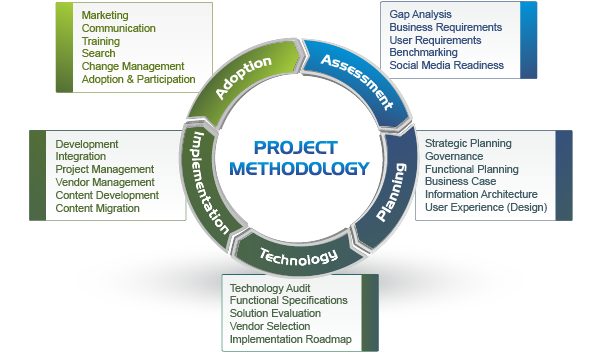 When looking at strategy as it relates to the process of developing or redesigning an intranet, strategy encompasses the first two phases of Prescient Digital Media's Intranet Project Methodology © 2012, Assessment & Planning. It is easier to look at strategy from the top-down, beginning with the vision and 'visualizing' the end state or model of success for the intranet. While a successful intranet 'looks' very different from organization to organization, another way to visualize success is as a model or mental construct (the elements of success). The model or construct I developed some years ago, which guides the work Prescient has done with dozens of intranet clients, is called the Nexus of Intranet Success. Nexus [‘nEksIs] comes from a Greek word meaning ‘meeting place’ (a fitting label given the intranet’s importance as the only true, universal meeting ground or ‘water cooler’ in the average organization). The most critical determinant of an intranet’s success – and I cannot stress this enough – is people. In particular, the crucial participation and support of senior management (the heart or inner ring of the Nexus model: Executive Support) and the end users (the all encompassing factor represented by the outer ring ‘Motivated Users’ of the Nexus model). The model therefore visually depicts the significant importance of people. Ironically, the engagement of both senior management and end users are critical tasks during the intranet strategy. The Nexus model therefore represents the desired end-state, not the process for getting there. I’ve been known to say that the intranet is not a technology system or IT project, nor is it a communications vehicle or channel; the intranet is a business system that should represent and support all areas of the business. In fact, the intranet is really only one part technology, and many parts people and process (which begins with intranet strategy). Toby Ward, a former journalist, prominent writer, speaker on intranets and intranet planning, is the President of Prescient Digital Media. To learn how to undertake effective intranet strategy please see our intranet service offering The Intranet Strategy, or download the free Good-To-Great Intranet Matrix. For more information, contact us directly.